Both personality and consciousness were properties of the human psyche that were central to the thinking of Carl Jung. He observed the stability of certain personality types among people, but also their complexity and unpredictability. He defined the archetypes as these stabilities, and the complexities and unpredictability he dedicated to the constant interplay between the conscious self and what he termed “the shadow side” of the personality. The ideas of Jung have been debated, and other personality traits than his archetypes find broader support today, but new support to Jung may now come from a mathematical perspective. I will give a short glimpse of a mathematical hypothesis for personality here that I intend to elaborate on elsewhere later. Within computational neuroscience mathematical theories have contributed a lot to increase our understanding of how brains work, not only at a neuronal level, but also at network level, for instance, how memories are stored and recalled, and how we associate and make decisions (See e.g. Rolls and Deco, 2010). Interestingly, more diffuse properties of the human psyche, like personality (Van Eenwyk, 1997) and consciousness (Tononi, 2004) may, in fact, be connected to mathematical properties of networks, and in this post I will focus on what mathematics can teach us about these matters. In mathematics there are complex models for information transfer across networks called attractor networks, and the neural network of our brain appears to be well approximated by these models. I have already touched upon these attractors in a previous post on creativity, because creativity is linked to the ability to easily move from one attractor state to another along new or alternative paths. Attractor networks are built from nodes (for example neurons) which typically are recurrently linked (loops) with edges (like synaptic connections), and the dynamics of the network tend to stabilize at least locally to certain patterns. These stable patterns are the attractors. For example, a memory stored in long time memory may be considered as a so-called point attractor, a subnetwork of strongly connected neurons. The point attractors are low-energy states in an energy landscape with surrounding basins of attraction, much like hillsides surrounding the bottom of a valley, as shown in the figure below. Random perception signals are like rainfall finding its way down to the closest attractor, leading to a thought, a memory recall, an association or a decision to react. Also other types of mathematical attractors exist, like line-, plane- and cyclic attractors, and these have been used to explain neural responses like eye-vision control and cyclic motor control, like walking and chewing (Eliasmith, 2005). Common to these attractors are their stability and predictability, and this is good with regard to having stable memory and stable bodily control, but what about personality? Is personality also an attractor? Do we all have our basins of attraction, which pulls our personality towards stable behavior? Probably yes, but if you think about it, personality is a more unpredictable property than memory and body control. We think we know someone, and the suddenly they behave in an unexpected manner. Still, the overall personality seems to be more or less stable. How can something be both stable and unpredictable at the same time? Well there is another class of attractors that may occur in attractor networks. These are the strange (or chaotic) attractors, and they are exactly that, partly stable and partly unpredictable. 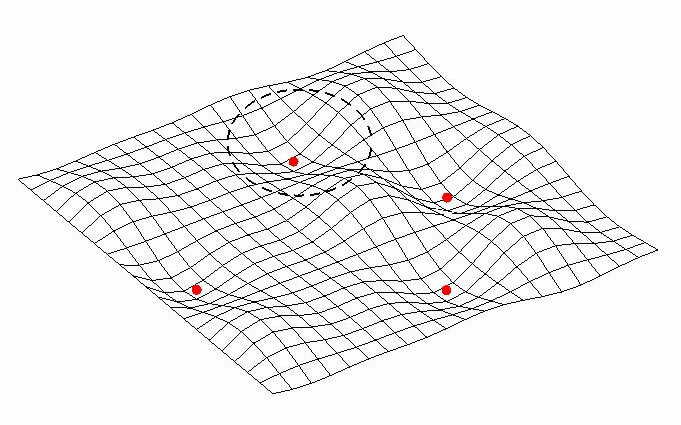 We say they are bounded, but non-repeating. A famous example is the Lorenz attractor discovered by Edward Lorenz while he was programming his “weather machine” where typical weather patterns appeared, but never repeated themselves. 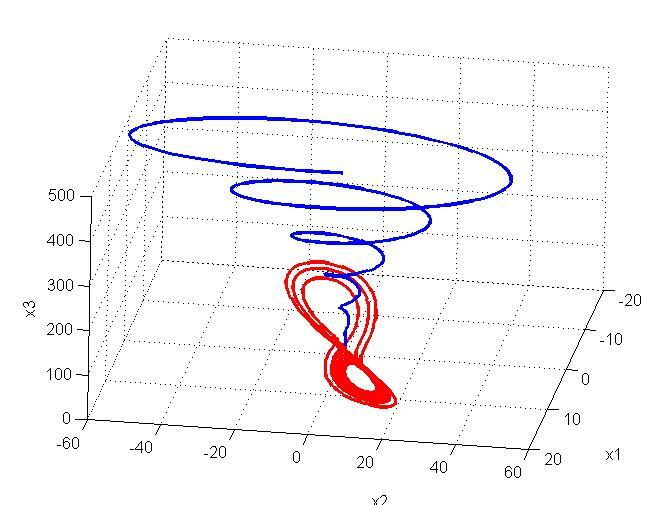 In the figure below the blue curve is pulled towards the red strange attractor state, and once it enters the attractor, it is bound to follow a certain pattern, though it never repeats itself. 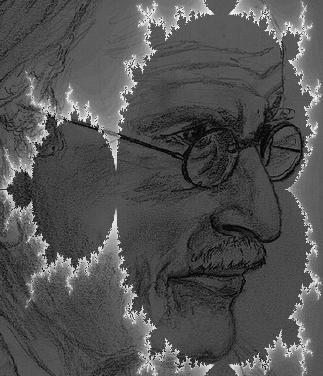 The discovery of strange attractors led to the development of chaos theory and fractal geometry in mathematics. Many phenomena around us may develop smoothly in linear predictable fashions until a certain border is reached, at which point a chaotic state appears before a new order may be settled. Just think of water being heated towards boiling temperature. A chaotic state occurs just as there is a transition from liquid state to vapor. Some scientists now believe that the transition from unconsciousness to consciousness may be a similar transition between states. The mathematical model of consciousness proposed by Tononi (2004) is based on the assumption of the capacity of a network to integrate information. If the level of information integration crosses a certain limit, a new and emergent state is entered, consciousness. This corresponds to a fundamental change in the property of the network as a whole, and I think we can all agree upon the fact that there is a fundamental change between being asleep and being awake. There is no linear transition between the two. Well, a person’s personality is of course most apparent in our most conscious state, where we act in a dependable and responsible manner, although there is also an unconscious side to it, according to Jung, and it is often referred to as the “shadow” of our personality. The shadow side of our personality, residing in our unconscious, is according to Jung, balancing our conscious side, and it also holds the key to relaxation, serendipity and creativity, but also to the irrational behavior in stressed situations. This was also recognized by Walter Lowen (1982), a systems science researcher on artificial intelligence who developed a model for personality that reached far beyond the simple dichotomies of Carl Jung. To many, this may just sound like psychological thinking, but if we combine the theory of strange attractors from chaos theory with the model of consciousness by Tononi, I think we may find theoretical support to the thoughts of Jung. According to Tononi, consciousness depends on both information integration and information segregation. Loosely speaking, consciousness is generated by a “central” network complex with a high capacity for information integration, whereas other, but connected sub-networks containing specific and segregated information, may contribute without actually being part of the central network complex. A good example is the Cerebellum, which contains more neurons than the entire remainder of the brain (the Cerebrum). Still, the activity of the Cerebellum is totally unconscious to us. The Cerebellum contains segregated information and procedures, like books and instruction manuals in a library. This information may however be integrated by other parts of the brain, combined with input signals from our senses into a conscious experience. The main point here is that certain parts of the brain, and certain circuits, are more involved than others in what we can call the conscious complex of the brain. The other parts are connected and contribute, but work quietly in the “shadow”. The way information is integrated is still unknown, but it may very well be in the form of strange attractors, cycling through regions of the brain in somewhat unpredictable, yet bounded manners. Some attractors work within the conscious complex, others work in connected, but unconscious parts. I believe that personality depends on the properties of these strange attractors, and how these attractors are distributed, either within the central conscious complex, or in the more peripheral unconscious network space! For instance, for the personalities Jung characterized as “Feeling” (correlated with being “Agreeable” in Big Five theory) the ventral circuits involving the sub-cortical brains parts like the Amygdala, may be part of a strange attractor within the conscious complex, whereas personalities being “Thinking” (or less “Agreeable”) may have more dorsal conscious attractor states. This can serve as a theoretical explanation to why some people tend to base their decisions more on values and emotions than others who tend to make more impersonal decisions based on logics. Other personality traits are also possible to explain by this theory. Personalities are strange attractors, unpredictable, never repeating, but bounded. People have similar types, yet we are all being different. In the mathematics of chaos and strange attractors this is known as the sensitive dependence on initial conditions. It was this that lead Lorentz to discover the chaotic property of his weather machine. Others have referred to this as the butterfly effect, how the minimal effect of a butterfly flapping its wings can through a cascade of causalities result in a storm on the other side of the world. We are all born with different initial conditions, different families, different environments, different experiences. We may be born with the same set of strange attractors, but we will never be equal, only similar, since we are bounded within the same basins of attraction. It is this individual unpredictability that makes it so hard to understand the human mind. The only thing we can do is to use statistical models like the Big Five (factor analysis) or Jung/Lowen (dichotomous classification) to try to separate the stable properties of the attractors from the unpredictable chaotic variation among individuals. However, new brain scanning technologies now provide unprecedented possibilities to go beyond Carl Jung and to study the strange attractors of the brain by multivariate statistical meta-analysis in order to get a better grip on what makes us similar, yet different. I think Carl Jung was not far off! Rolls E.T and Deco G. (2010) The noisy brain. Oxford University Press Inc, New York. Van Eenwyk, J. R (1997) Archetypes & Strange Attractors – The Chaotic World of Symbols. Inner City Books, Toronto, Canada. Tononi, G. (2004) An information integration theory of consciousness. BMC Neuroscience, 5:42. Eliasmith, C. (2005) A Unified Approach to Building and Controlling Spiking Attractor Networks. Neural Computation, 17(6), 1276-1314. Lowen, W. (1982) The dichotomies of the mind. Wiley and Sons, New York. Reidbord SP & Redington DJ. The dynamics of mind and body during clinical interviews; current trends, potential, and future directions. In Port R & van Gelder T (Eds) Mind as Motion: Dynamics, Behavior and Cognition, MIT Press, pp 527-547, 1995. Redington DJ & Reidbord SP. Chaotic dynamics in autonomic nervous system activity of a patient during a psychotherapy session. Biological Psychiatry, 31(10):993-1007, 1992. Reidbord SP & Redington DJ. Psychophysiological processes during insight-oriented psychotherapy: Further investigations into nonlinear psychodynamics. Journal of Nervous and Mental Disease, 180(10): 649-657, 1992. Reidbord SP & Redington DJ. Nonlinear analysis of autonomic responses in a therapist during psychotherapy. Journal of Nervous and Mental Disease, 181(7): 428-435, 1993. Thank you very much for your interesting comment! I will certainly read your papers. – Attractors as entry-points to an immutable list or tree structure of representation. – That we have the ability to temporarily “check out” one of these attractors as stand-ins for the self. – The “self” is conceptualized as the head of the tree, looking backward and inspecting these compiled representations. – Perception of another entity activates the closest-match attractor-tree, which then reflects against the self-tree. Thanks a lot for sharing these thoughts. Yes, I have read some Jung and also have a couple of R-projects on github, so your philosophical/comp.sci speculations absolutely make sense to me.